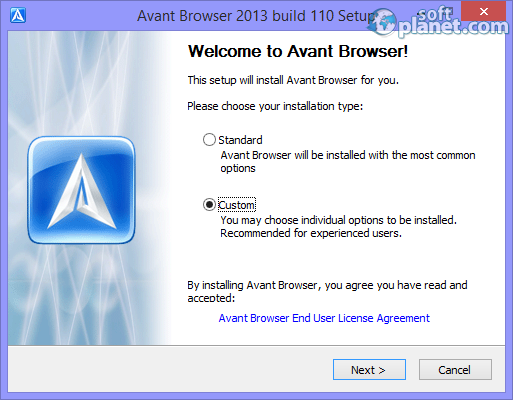 SoftPlanet makes it possible for everyone to get free Avant Browser download directly from our servers. There is no registration needed for downloading. 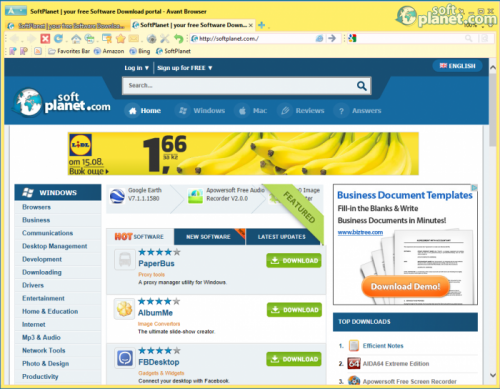 Avant Browser 12.5.0.0 is one fast, reliable, clean and safe alternative to the well-known Internet Explorer, Mozilla Firefox or Google Chrome web browsers, and let's not forget it can be downloaded for free too. There are no ads, commercials or adware that come with it. Many times many users have received the message that their browser has crashed and it has to be restarted. Well, not anymore, because this one is built with modern anti-freezing technology. This is why the program gives users the feeling of surfing the web as if they were surfing on waves. Avant Browser uses the same engine as Microsoft Internet Explorer. Moreover, it is a multiprocessor browser. This is the reason why it works so quickly and opens pages and downloads files with ease. The latest version of Avant Browser was updated to support the newer versions of Internet Explorer, Mozilla Firefox and Google Chrome. This solves the compatibility issues that may arise and makes the app more compatible. There are also five fixes that repair errors in previous versions. The first one fixes a bug that prevented the Help page from opening. The second one repairs an issue that occurs while loading the speed dial. An error that happened while using the app under the Firefox engine was also fixed and the last fix is for some minor issues. The online bookmarks feature gives users the freedom to reach their own lists wherever they go. Another function of Avant Browser 12.5.0.0 is Private Mode. With it users can share the same computer without worrying that someone can check what they have browsed or downloaded. The latest release has an updated Firefox and Chrome engine, fixed zoom size of the new page and toolbar settings in online storage. If, for a reason like a power outage, the browser did not close properly, on the next run it offers to restart again: it opens the blank home page or loads as it was before the crash. The Avant Browser icon in the upper right corner of the window works like the Windows Start button. There users can find every available function of the program. The icons are fully customizable and the size of them and the location of the bar can be changed at any time. There is a little icon next to the Minimize one, which can hide the window from the desktop. Another one, looking like a little shirt, is nearby and it is used to change the skins of the browser. When using it, you can choose how to open a new tab. Click the little black arrow next to the blue cross for a new tab and you can decide to start with the current, a blank or the home page. It is very easy to add or remove icons - just right-click on the bar and select Customize Buttons. The add-on buttons: Customize, Download, Auto-fill and New Session, are a nice feature of this software. They provide quick access to these functions with just a single mouse click. This app can easily be called a better, upgraded version of Internet Explorer. Avant Browser 12.5.0.0 is your choice if you are looking for a different web browser that has the functionality of other programs in its class. This is enhanced by the fact that the app is even more compatible thanks to the new build. This program differs from other web browsers with many things, but it can also be used in conjunction with them, because it is also compatible with other web browsers. Our security scan shows that Avant Browser is clean from viruses. 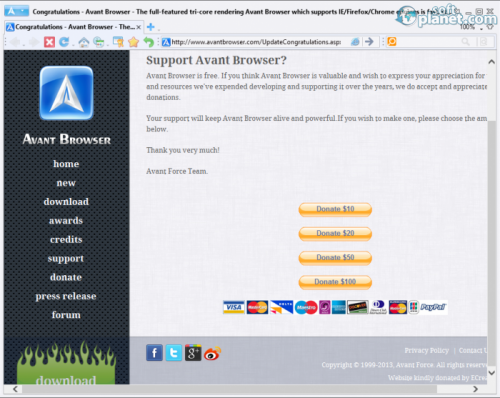 The current version of Avant Browser has been scanned by our system, which contains 46 different anti-virus algorithms. That ensures that Avant Browser 12.5.0.0 is 100% safe for your computer.